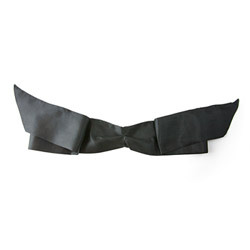 Overall this soft darkness ribbon blindfold is a great addition to a couples collection. Fun and exciting for both involved. Adds more pleasure to your sexual experience. Soft satin ribbon long enough to tie easily. Inexpensive and sure to please. I would recommend that couples try this out. This review is for the soft darkness ribbon blindfold. This is a super soft elegant looking blindfold. Made of satin material. It feels very nice on the eyes and face. It is very dark so that you can not see through it. It wraps around your eyes, and you tie it in the back. Measures 38” long and is 2.5 inches wide. Stays tied. You could also use this to tie hands together or behind back if you wanted to use it in that way. Works well either way. By using it as a blindfold, it allows a more heightened sexual experience because you can’t see what areas of the body will be touched or what toys will be used. It’s more thrilling for both involved. I would recommend this blindfold to couples. Nice long, soft & silky blindfold. Great for blindfolding during foreplay to heightened your sexual senses. Can be used to tie hands if wanted. The material is holding up after many uses. Would still recommend using this blindfold. Thank you for viewing Soft darkness ribbon blindfold review page!